The Curation Society (University of the Arts London) and the Goldsmiths Visual Cultures Society are pleased to present a co-curated group exhibition ‘EXCHANGE’. It is the second show to be presented by the UAL x GOLD Collective. 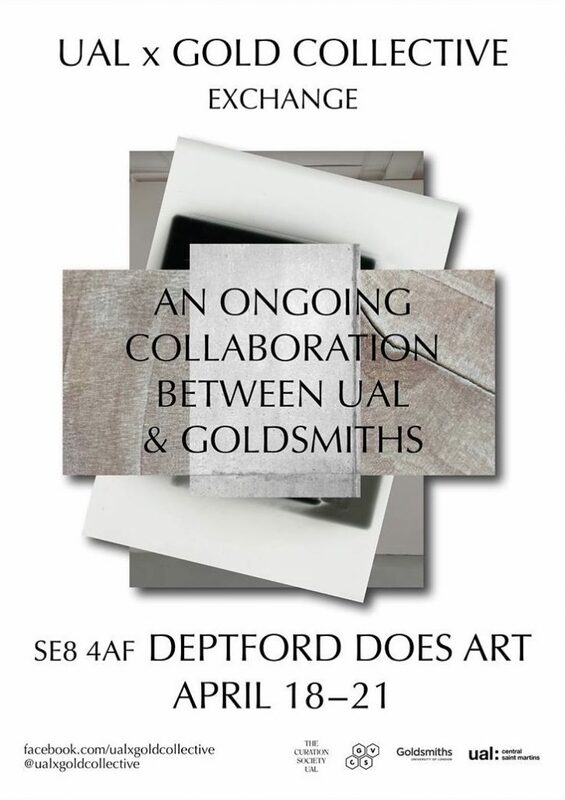 The exhibition features both new and previous works from UAL students and Goldsmiths students. The artists work across photography, video, painting, and sculpture. The intention of the collective is to encourage greater interaction between artists at the universities, to open up new conversations and to create opportunities for exchange. The exhibition is part of an ongoing collaboration. The artists from each university have been selected and curated by the other, with the aim to present both the connections and disparities between works. ‘EXCHANGE’ offers a particular (macro) vista of the artistic practices of the two institutions, working at the level of panorama, with opportunities for (micro) investigation. A sense of incongruence – between how sculpture is used, for example – represents what is urgent and exciting in emerging work. ‘EXCHANGE’ intends to consider what it means to represent an institution, how one is seen by the other, and how the relations between different practices reflect larger operations of taste and value. 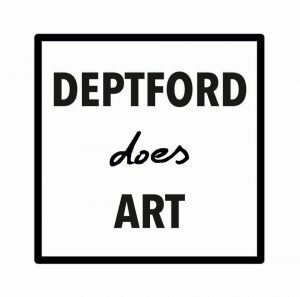 Curated by Monika Milewska and Jennifer-Louise Wilcox from Goldsmiths Visual Cultures Society and Madeline Tabary and Ellie Higgins from The Curation Society UAL. 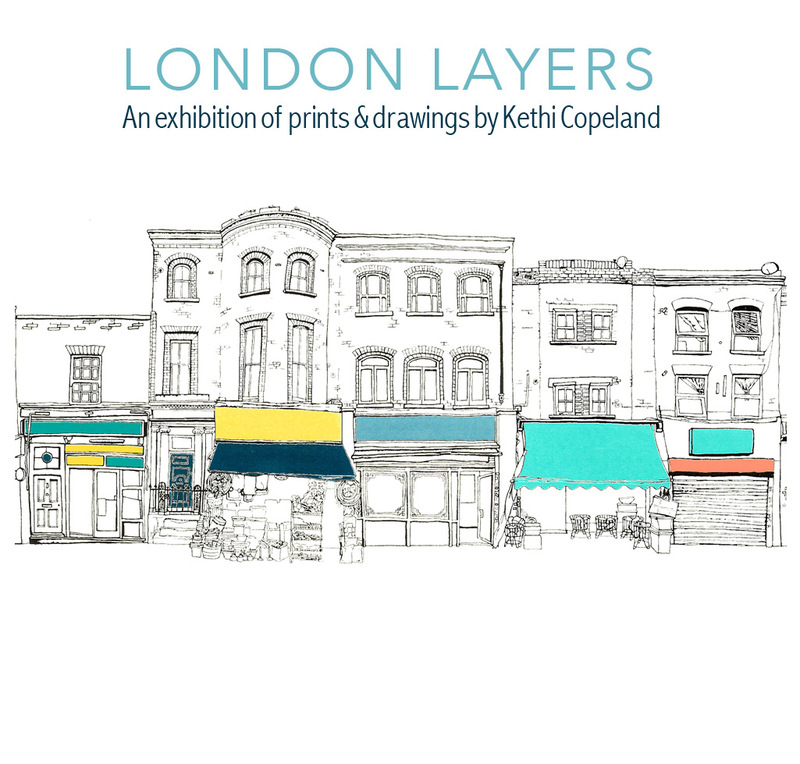 London Layers is a Solo Show of Kethi Copeland’s prints and drawings which explore the different layers within a city. London is an ongoing source of inspiration with architecture as a focal point for exploring the many layers of this rapidly changing city and the connections with our memories and lives. The combination of delicate line drawing with blocks of printed colour in Kethi’s prints highlight the intriguing cityscape and lends a distinctive style to her work. Using the craft of silk screen-printing, Kethi builds up the image through multiple layers of print. This exhibition offers a unique experience to step inside the artwork; The gallery is on the street that inspired her recent print series ‘ The High Street’ with some of the drawings being made from there. Kethi Copeland captures the diverse mix of London’s architecture in original prints developed from her hand drawings. The artwork looks beyond the well-known and iconic buildings inviting you to find connections with your senses and memories of the city. Taking inspiration from walking and drawing in the city she works in series; documenting London by the meter in linking prints & wide panoramic screen-prints. A Walk by the River series explores the architecture of of both the North-bank and South-bank of the Thames; by making her drawings from a position on the opposite bank, the twists and turns of the river are rearranged to create one continuous line upon which both the well-known and under-appreciated of London’s riverside architecture co-exist. In The High Street: Kethi reflects on the high street as a focal point for a rapidly changing city. Her prints acts as a snapshot, revealing the layers of change visible in the architecture, shop fronts and signage. Using 22 layers of printed colour and fine detailed line work, ‘The High Street’ pushes the level of detail that can be achieved with screen-print. The combination of delicate line drawing with blocks of printed colour in Kethi’s prints highlight the intriguing cityscape and lends a distinctive style to her work. To achieve this she creates stencils from her drawings, each colour requires a separate stencil. Hand printing the edition is central to how the final image takes shape, with the final colours being chosen through a process of colour mixing and making test prints, until a final combination and balance of colours is found. Using the craft of silk screen-printing, Kethi builds up the image through multiple layers of print with extreme attention focused on registration. For full list of events please visit our Facebook Events Page. Events are added on a weekly basis so do follow us on Instagram, Facebook or Twitter for updates.